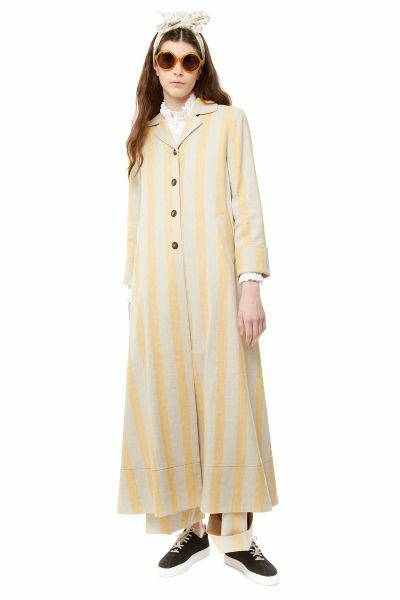 The yellow & oatmeal Wilfred coat is a long single breasted coat with a neat collar and little lapels. It has been designed with an exaggerated A-line shape that falls to your ankles and is fitted around the shoulders. The coat fastens with 4 Cabbages & Roses engraved buttons. The sleeves are a flattering bracelet length and the coat has practical welt pockets. Please note that the sleeves only are lined, it has been designed as a light weight summer coat. The Wilfred coat’s fitted shoulders and sleeves give a neat look and make way for the dramatic width of the hem that billows behind you as you walk. A perfect summer coat. Caring for your Coat. We recommend that you dry clean this coat, with an ecologically friendly dry cleaner. Please do not wash. The coat can be pressed with a cool iron, please do not bleach or tumble dry Wilfred.